James W. Sisk Jr., ’66, released a novel titled Opening Day in March, 2018. James A. (Jim) Donahue, ’67, received the West Point Society of Philadelphia’s Dieal-Pryor Lifetime Achievement Award. Donahue currently serves as the President of the William Penn Chapter of the Association of the United States Army. William Campo, ’70, received the George Paull Award for contributions to high school basketball from the Markwood Basketball Club of Philadelphia for his work on the Philadelphia Coaches Versus Cancer campaign. Daniel A. Ward, ’78, is recognized in the 2018 edition of the prestigious Chambers USA: America’s Leading Lawyers for Business. Michael B. Magnavita, CPA, ’81, was announced as President and Chief Executive Officer of the Franklin Mint Federal Credit Union (FMFCU). Magnavita previously served as Executive Vice President and Chief Financial Officer at FMFCU since 1993. John R. Greed, ’82, was named Chairman of the Board for Mutual of America Life Insurance Company on March 8, 2018. Maura McMahon Primus, ‘90, was recently elected the Chairwoman of the Cape May County Chamber of Commerce. Cheryl (Giannattasio) Knauer, ’00, has been named among The Maryland Daily Record’s Leading Women. She is currently Director of Media Relations at McDaniel College in Westminster, Md. Katie E. (Bambi) Kohler, ’03, received two journalism awards from the Society of Professional Journalists Keystone Pro Contest, in addition to three Keystone Press Awards. Dan Basile, ’04, and wife Jen had a son, Spencer Eoghan, on Jan. 26, 2018. Janet Marie Doherty, Esq., ’05, and Felicia S. Johnson, ’13, were named to the Board of Directors for the Living Beyond Breast Cancer organization in January, 2018. Michael A. Luongo, MBA, ’05, has joined Hamburg, Rubin, Mullin, Maxwell & Lupin, PC as an associate. He will practice primarily in the areas of business litigation as well as assist clients with personal injury matters. Maria A. Dikun, ’06, married Matt Perez, on Jan. 14, 2018. Kimberly Davidow, ’09, married Sean O’Grady on Jan. 13, 2018. Ashley Chilcoat, M.S., ’14, will be joining the Pennsylvania Soccer Academy team as Academy Director. Chilcoat was a four-year starter for the La Salle women’s soccer team. Felicia S. Johnson, ’13, was named to the Board of Directors for the Living Beyond Breast Cancer organization in January 2018. 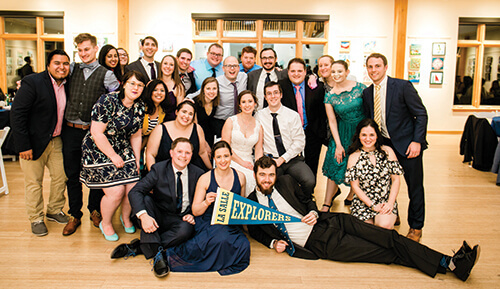 Alex Jones, ’12, and Alysia Korn, ’13, were married on April 7, 2018, in Baltimore County, Md., with more than 20 La Salle alums in attendance, including many friends from La Salle Ultimate Frisbee. Back Row (l to r): Steve Duzinski, ’15, Tyler Kimmel, ’13, Christine Koyithara, ’11, Shannon (O’Neil) Adams, James Iannizzotto, ’10, Jennifer Pallister-Iannizzotto, ’10, Eddie Mattola, ’11, John Phillips, ’11, MBA ’13, Brendan Young, ’12, Michael Adams, ’11, Samuel Pickard, ’13, Gregory Smith, ’12, Colleen Costello- DeBlieck, ’11, Amy (Bachmann) Mattola, Patrick Terranova, ’11; Middle row (l to r): Katie McGuinness, ’11, Veronica Ventura, ’11, Victoria Vavala, ’13, Julia (Walsh) Young, ’12, Alysia Korn, ’13, Alex Jones, ’12, Pamela (Woodward) Terranova, ’09; Front row (l to r): Jason Bodman, ’11, Mary (Janoson) Bodman, ’13, Conor McCarthy, ’15.